1. Julián Palacios. 2. Peña el Gato in Baños de Río Tobía (Rioja). 3. 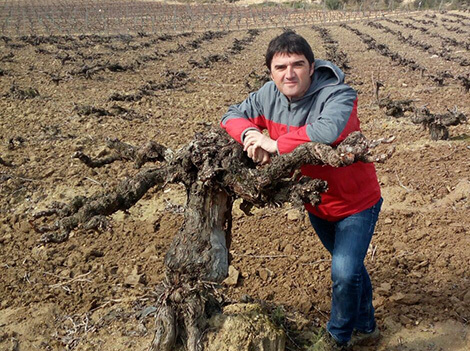 Francisco Barona stands next to one his ancient vines. 4. The seminar. Photo credits: J. Palacios, Amaya Cervera, F. Barona. 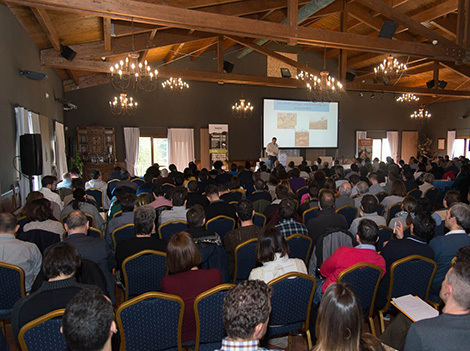 “For a vine to be 80 years old in 2100, it must be planted in 2020.” Julián Palacios, a staunch advocate of traditional vineyards, used this phrase to open the third edition of a technical seminar which he hosted in Laguardia (Rioja Alavesa) earlier this month. The highly inviting title this year was Designing a long-lived vineyard. Somehow though, his counter-cultural conference managed to gather over 200 wine professionals at the Villa Lucía Wine Centre in Laguardia. Among a young audience, many leading producers from Rioja and other wine regions were present. Barona started buying old vineyards in 2010 -he currently owns 28 plots planted between 1908 and 1948- and fermented grapes for the first time in the 2014 vintage. His red Francisco Barona is a field blend of vineyards scattered across the region. They boast on a variety of soils and varieties other than Tempranillo such as Bobal, Garnacha or Monastrell and the whites Albillo and Jaén, which are common in old vineyards. “These varieties used to be considered of little value, but they add freshness, acidity and complexity to the wine and contribute to its longevity. They are a natural tool to achieve balance as opposed to oenological adjustments,” Barona pointed out before listing the key factors he takes into account ahead of choosing the location of a long-lived vineyard. His top ten include working in regions with relatively long winter rest periods and looking for high, well-aired areas with low risk of fog and frost. As well as well-drained soils with water retention capacity, Barona recommends sites that can stimulate root development. In his view, vigour is essential to grow balanced plants. He compared medium vigour in vines with a person’s optimal weight. Vines must keep in good shape too. Possibly, the most important difference between terroir-driven and industrial winegrowing lies in the plants. Jean Philippe Roby, researcher and professor at the University of Agricultural Sciences in Bordeaux, described the impoverishment of genetic diversity since the 1970s when a few clones, both for vinifera and rootstocks, started to dominate on a global scale. Roby believes that a model that fails to guarantee biodiversity is not sustainable. “Without massal selection, there is no future,” he argued. Old vineyards are not only the guardians of biodiversity, but a source of solutions to deal with the countless challenges that winegrowers face, notably wood diseases. “Clones that were developed 20 years ago don’t have this ability,” Roby insisted. In contrast, he added, the analysis of different biotypes within the same grape variety has shown alcohol variations of up to two degrees in the case of Cabernet Franc. In this regard, the French professor praised the work of PORVID, a Portuguese association whose efforts are focusing in preserving the intra-varietal diversity of more than 300 grape varieties in Portugal. As for the management of old vineyards, Roby recommended to replace dead vineyards with their own wood instead of clones. He spoke in favour of grafting in the vineyard to minimize the risk of spreading the disease, although he acknowledged that this recommendation is based on 40- to 60-year-old vineyard data. “We don’t know what will happen with current plantings,” he warned. 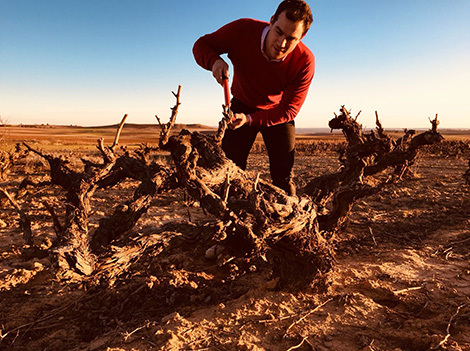 In a passionate intervention, Rioja producer and wine researcher Juan Carlos Sancha agreed with Roby and admitted that wood diseases are more prevalent in vineyards planted by him rather than those planted by his grandfather. The apple of his eye is Peña El Gato, a very special vineyard planted at 700m of altitude in Baños del Río Tobía, a particularly cold area of Rioja Alta. 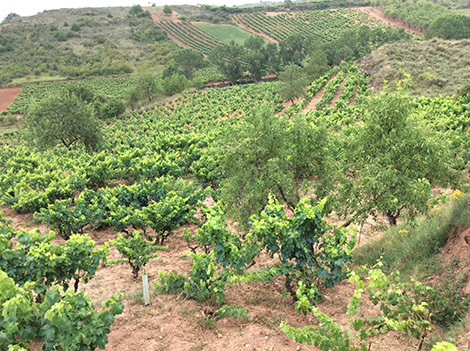 After inheriting half a hectare planted in 1917, Sancha has built a fascinating old vine Garnacha project in this area. “The year a man married it was customary to plant a vineyard to feed his offspring,” he recalled. Vineyards are seen very differently nowadays. Irrigation, for instance, is now a key issue in winegrowing. “In recent years, over 50 doctoral thesis have focused on irrigation against none on old vines,” Sancha pointed out. He also criticized the politics of subsidised uprootings and the lack of protective measures for old vineyards. “As 60% of Rioja vineyards are mechanically harvested, old vines are on the edge of extinction unless they are supported by a sound investment project,” Sancha warned. An agronomist who has actively researched minority grape varieties in Rioja, Sancha highlighted the main quality aspects of old vines: low yields, less vigour, better hormonal balance and starch supplies stored both on roots and trunk. He also pointed out that with 5,100 vines per hectare, old vineyards in his village show significantly higher density than current plantings while head-pruned vines allow a perfect distribution of vegetation and bunches. “Universities have not popularize bush vines because it’s a hard sell, but they have proven to be able to live up to 100 years in Rioja. Trellised systems have yet to prove it,” he said. But what makes a vine old? There isn’t a clear definition, Sancha said. 35 years seems to be a commonly accepted figure, but this number can vary widely from one region to another. Probably, the most comprehensive classification comes from Barossa Valley in Australia as a result of their staunch calls against uprooting. Their Old Vine Charter registers vineyards by age in ascendant order: old (≥ 35 years) survivor (≥ 75 years), centenarian (≥ 100 years) and ancestors (≥ 125 years). From an international perspective, Spain is viewed as a source of a considerable old vine heritage, although there has been no particular style, region or category of wine that has fully championed this legacy. According to Juan Carlos Sancha, out of 65,000Ha under vine in Rioja, only 0.6% are registered to be over 90 years old. This percentage is higher in regions like Toro and Bierzo or in specific areas of Rueda (Segovia) and Ribera del Duero (Atauta) where pre-phylloxera vines have been preserved. A staunch advocate of “viñedos singulares”, the new single-vineyard category in Rioja, Sancha explained that the requirement for vines to be over 35 years of age is meant to ensure the use of traditional vineyards rather than the massive planting of clones that came afterwards. The question is: Will this argument be remembered in 35 years’ time? Better yet: Will we be able to look back in 2050 and say “yes, we did it, we preserved biodiversity in our vineyards”? A better future for Spanish wines with pre-phylloxera grapes?